Everyone knows .com is the most popular and widely used domain extension, but did you know NEW generic Top Level Domains (gTLD) will soon be available? Perhaps most exciting for us is the new .FARM extension. The Market Place wants to help you by making sure you have the chance to secure your .farm domain as soon as it becomes available. When registration opens in a few weeks, we’ll do our best to purchase your domain. If we are unsuccessful, your money will be completely refunded. Imagine your farm or business name… CircleJ.FARM, Angus.FARM, CitrusShop.FARM could be yours. This also means you could have a new email address like info@cattle.FARM These new extensions will work like all others, and will be used worldwide. 1. Small businesses can get lost in the .com shuffle; stand out with a .FARM! 2. A .FARM domain tells your audience that your site is new and current. 3. 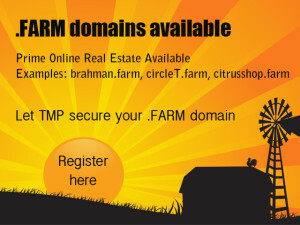 A .FARM domain instantly frames the scope of your business to farming/agriculture. 4. Once you own it, it’s yours to keep as long as you want to keep renewing it. 5. As opposed to another generic gTLD like .web, .FARM is specific enough to give your name and domain an edge over the competition, and make your business easier to find on the web. $50 secures your domain for the whole year. Even if you are unsure how to use it this year, purchasing it early reserves your right to own it forever if you so choose. After the initial year, you will have the opportunity to renew it for years in advance, without competition. .farm could look really good on you. Are you a commodity organization? Share this with your members.